How to get there and to move around. There are six to seven flights daily from Manila to Busuanga Airport. From Busuanga Airport, one can take the service vans parked just outside the terminal. The transport fee from the airport to Coron Town is Php150 per head. The commute from the airport to the town is about 30 to 40 minutes. 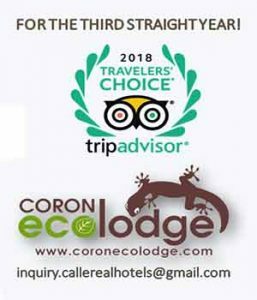 Coron EcoLodge is along Calle Real. In case the driver is not familiar with the street signs, just mention that Coron EcoLodge is walking distance from the Town Municipal Office, Fire Station and Covered Multi-purpose Court. The common public transportation in Coron is a motorized tricycle wherein friendly drivers will gladly take you around for a tour around town for just Php10 per head. Better yet, you can rent a motorbike or mountain bike to make your rounds more enjoyable and exciting. For trips to other municipalities, jeepneys, buses and commercial AUVs are commonly available.